SEOUL, Oct. 16 (Yonhap) — A team of South Korean archaeologists has found the mummy of a man wearing Chinese clothes in an unearthed tomb believed to date back about 2,000 years in western Mongolia, a state-run think tank said Monday. 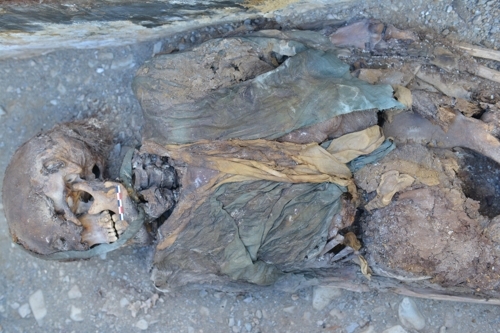 The National Research Institute of Cultural Heritage said the team discovered the mummy of a man about 165 to 170 centimeters tall at the tomb in the Shiveet Khairhan remains of Mongolia’s Altai Mountains. The team from the research center discovered two stone tombs dating from the third to fifth century B.C. built by nomads in Mongolia and Russia, as well as three other smaller ancient tombs built around 2,000 years ago. The mummy, found in one of the three ancient tombs, was wrapped in a Chinese-style robe, with the lower part of the clothes missing, and lying in an upright position. The robe was made in left-over-right fashion, called “youren” in Chinese, which means the right part of the robe is under the left part. This fashion originated in early ancient China, while the right-over-left fashion, called “zouren,” was used by people north of China. The institute plans to conduct further research into whether the man was a merchant who had traveled along the ancient Silk Road trade routes or migrated from China to a region north of the country. It also plans to have the mummy’s clothes transferred from a Mongolian archaeological think tank to South Korea and to initiate research on the male mummy’s genes and eating habits, among other things.